For the British Admiral, see Howard Kelly (Royal Navy officer). 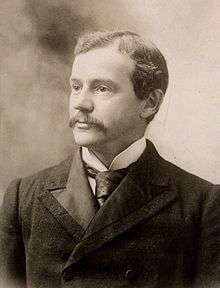 Howard Atwood Kelly (February 20, 1858 – January 12, 1943) was an American male gynecologist, one of the "Big Four" founding professors at the Johns Hopkins Hospital in Baltimore, Maryland. He is credited with establishing gynecology as a true specialty, by developing new surgical approaches to women only diseases and through pathological research. He was born at Camden, New Jersey and educated at the University of Pennsylvania, where he graduated B.A. in 1877 and M.D. in 1882. He was for some years a member of the faculty of medicine at McGill University. After completing his medical education, he went to Kensington where he choose to practice gynecology. Dr. Kelly visited the best surgeons of abdominal and pelvic operations in Europe before returning to the University of Pennsylvania. In 1888–89, he returned to the University of Pennsylvania, to become associate professor of obstetrics. While in Philadelphia he founded Kensington Hospital for Women. In 1889 at the age of 31 he was hired to be the first professor of gynecology and obstetrics at Johns Hopkins University and gynecological surgeon at Johns Hopkins Hospital. The other "Big Four" founders were William Osler, Professor of Medicine, hired from Pennsylvania in 1889 as well; William Stewart Halsted, Professor of Surgery; and William H. Welch, Professor of Pathology. During his 30-year career at Hopkins he created new surgical approaches to women's diseases and invented numerous medical devices, including the cystoscope. He was one of the first to use radium to treat cancer, founding the Kelly Clinic in Baltimore, one of the country's leading centers for radiation therapy at that time. In 1913 he helped found The National Radium Institute with James S. Douglas, a mining executive and philanthropist, to extract radium from US domestic sources for use in cancer treatment and possible industrial use and in the process to develop more efficient methods of radium extraction. At Johns Hopkins, Kelly was responsible for organizing the courses, lectures, and clinical work for the medical students. In 1888–89, he returned to the University of Pennsylvania, to become associate professor of obstetrics. Some of Dr. Kelly’s notable contributions were using a wax-tipped catheter to detect ureteral calculi and altering the operation for an umbilical hernia. His attainments in his special field brought him many honors. He received the honorary degree of (LL.D.) from Aberdeen and Washington and Lee universities and from the University of Pennsylvania; he served as president of the Southern Surgical and Gynecological Society in 1907 and of the American Gynecological Society in 1912. He was a fellow or honorary member of obstetrical and gynecological societies in England, Scotland, France, Germany, Austria, and Italy. The Johns Hopkins Kelly Gynecologic Oncology Service is named for him. In 1943 a U.S. Liberty ship was christened the Howard A. Kelly. 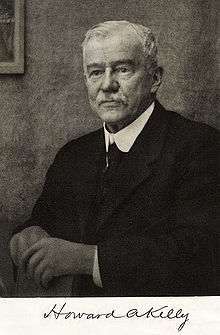 He married Laetitia Bredow, daughter of professor Justus Bredow, in 1889; they had nine children. Kelly was a devout evangelical Christian and was known to share his faith openly. Kelly was at one time a trustee of the Moody Bible Institute, and Bryan College and he wrote an essay entitled A scientific man and the Bible: A Personal Testimony, where he expressed his most cherished beliefs, including the divinity of Christ. This was published in the first volume of The Fundamentals, the founding work of Christian fundamentalism. In addition, he wrote the work How I Study My Bible (1926). He was a friend of H. L. Mencken and was frequently referred to in Mencken's writings. Kelly's sign — If the ureter is teased with an artery forceps, it will contract like a snake or worm. Kelly speculum — A rectal speculum, tubular in shape and fitted with an obturator. Kelly forceps – Large haemostatic forceps; arguably among the most common and best known surgical instruments. Kelly's stitch — Surgery for the bladder neck to correct stress incontinence of urine. ↑ "Obituary: Dr. Howard Atwood Kelly". Science. 97 (2512): 176–7. February 1943. doi:10.1126/science.97.2512.176. 1 2 Barker, Lewellys F. (Feb 19, 1943). "Dr. Howard Atwood Kelly". Science. 97 (2512): 176–7. doi:10.1126/science.97.2512.176. ↑ Lutz, Stephen; Chow, Edward; Hoskin, Peter (2013). Radiation Oncology in Palliative Cancer Care, p. 5. John Wiley & Sons. ↑ Parsons, Charles L. (November 1915). Bulletin 104 - U.S. Bureau of Mines; Extraction and Recovery of Radium, Uranium and Vanadium from Carnotite (1 ed.). Washington, D.C.: U.S. Government Printing Office. p. 8. Retrieved 7 June 2014. ↑ "Howard Kelly, M.D., LL.D.". The British Medical Journal. 1 (4285): 236–7. Feb 20, 1943. ↑ "Howard Atwood Kelly". KennethWMilano.com. Retrieved 20 August 2010. ↑ Roberts CS (October 2010). "H. L. Mencken and the four doctors: Osler, Halsted, Welch, and Kelly". Proc (Bayl Univ Med Cent). 23 (4): 377–388. PMC 2943453 . PMID 20944761. Wikimedia Commons has media related to Howard Atwood Kelly. This article incorporates text from a publication now in the public domain: Gilman, D. C.; Thurston, H. T.; Colby, F. M., eds. (1905). "Kelly, Howard Atwood". New International Encyclopedia. 11 (1st ed.). New York: Dodd, Mead. p. 434.